Hitting the "B" key from the main menu starts the Batch send process. You enter a filename prefix, pick the volume to (repeatedly) send, and the ADTPro server will append a unique number to the filename for each image sent. The prefix you enter will be appended to the current working directory of the ADTPro server, and a 4-digit serial number and the suffix ".PO" (".DSK" for Disk ][ images) will be appended to it. If the current working directory were /apple/disks, the first disk would be saved as /apple/disks/BIGUPLOAD0000.PO. The next disk would be saved as /apple/disks/BIGUPLOAD0001.PO, and so on. If you run out of space (i.e. you already have 10,000 batch images saved), the ADTPro server will increment the number without any zero padding. Once you pick the volume to repeatedly send, you are prompted to insert the next disk to send and hit a key. Once contact is made with the host, the disk information starts reading and sending as with normal send operations. When the image has finished sending to the host, you will see a "Complete" message, which you must acknowledge by hitting a key. You are then prompted to insert the next disk to send and hit a key. 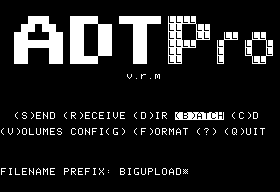 When you do, the same volume will be read and sent to the ADTPro server (presumably, with a different diskette that you inserted). The numeric suffix will be incremented with each disk you send; the ADTPro server will show the current disk name on its window. You can hit the Escape key at any time to stop the batch sending process and bring you back to the main ADTPro menu. Any time you abort a transmission, it is best to hit the "Disconnect" button on the server and re-connect by clicking on the button representing the connection type you are using. Copyright © 2006–2018 David Schmidt. All rights reserved.